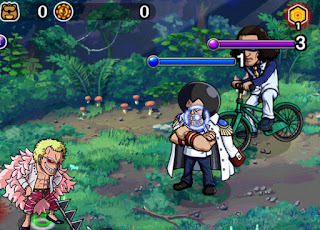 A forest full of marines, vices, veteran and Aokiji himself awaiting you. You will need to invest a lot of time until you can beat this challenge. Maxing specials, characters, raidbosses to overcome the despairs and chains of the marines. Stages 1-10 are so easy. You must get all your specials up. Socket abilities that heal you or reduce binds are your best friends. 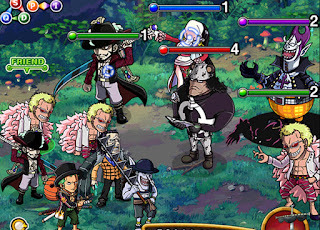 Bottom-left character can not be used on boss stage. Either you beat this forest by heavy DEF abilities or Heal abilities or both. Pure all in full damage crews will cause an end at Stage 19 or earlier. You MUST have Despair / Chain sockets. This stage is extremely easy when you have Lv.3 Despair and Lv.3 Chain sockets. Then hit Fullbody and Django. If you have only Lv.2 Anti Despair socket, use Usopps delay. Once again you really should have the anti despair /chain sockets. And this fight is won. Focus Tashigi first. Her first attack is higher than Smokers. Lv. 2 Anti Chain socket is required here to counter Domino. It's better to wipe all marines first then take over Domino. Don't let her go lower than 20% or else it's a Game over. Just hit them one by one without taking damage. It's possible Sadi attacks next turn. So get her first or delay them a little. 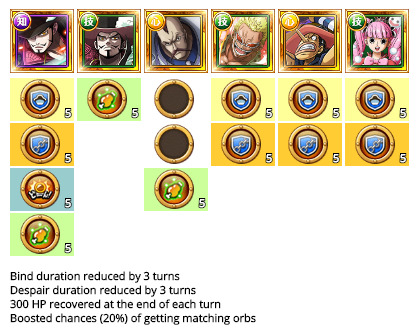 focus Momonga first if you have a high HP crew. Idealy you kill both before they hit you... or delay them. 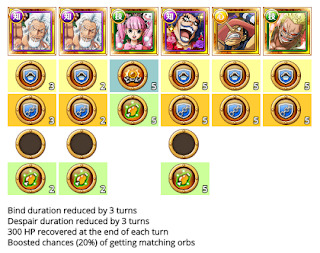 Use Helmeppo to build up your combo while you defeat him and switch to Garp with your last hit. 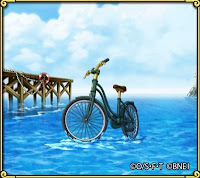 You must defeat Garp within 3 turns. Coby will buff himself without attacking. Use this to stall for another turn! 0 Pre-emptive: Chains middle row for 3 turns. Despair both captains for 3 turns. 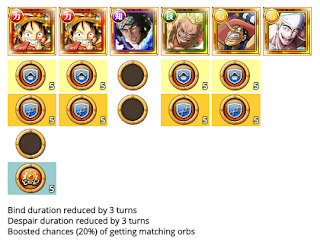 1 Chains bottom characters for 2 turns. 3 Chains middle right character for 3 turns. Gives you an orb-boost for 9 turns. Guess what. Doffy is the strongest of them all. You must wipe him in 1 turn after you defeat Mihawk and Moria or just after Mihawk. Get hit once by Boa to save up a turn. It's only 7000 damage. TIPP: It's possible to clear this stage without a turn delay. Pre-emptive: Debuff protector for 99 turns. Just attack him normaly. Since he will definitly chain the bottom left character and has a debuff protector just put Usopp in that slot. It's recommended for Aokiji to be sitting below 50% Health by the end of turn 5. Deal the final blow with an orb booster, 1 or 2 PSY characters with matching orbs and at least 1.5x ATK boost. 0 Pre-emptive: Chains bottom left character for 50 turns. Usual slasher setup. Autoheal is very important here, since your ship reduce your RCV to almost 0. If you want to heal even more you will need to redesign and allocate the sockets so you can achieve the 500 or 1000 autoheal. There is actualy just one thing to do. Stall up your specials until stage 10. Do the GOOD> GREAT> PERFECTs. And sockets will do the rest. Aokiji can buff his own ATK and doffy boosts his orb for the heavier PSY stages. It's up to you if you want to take autoheal. But this should be your standard setup. This crew is quite difficult to fulfill because you need luck to get socket tomes on rayleigh that you want. But IF that happens and you get a friend with those sockets. (I bet some people have maxed Ray's from sugos) you also need some survivability. A DEF char, something to heal you up if you are not lucky with [Meat] orbs, orb booster and if you want to utilize your healing i recommened Whitebeards ship. Alright. This is probably the easiest crew you can get beside the slashers. Heracles will grants you a nice set of guaranteed orbs which you can utilize with Doffy and Aokiji. 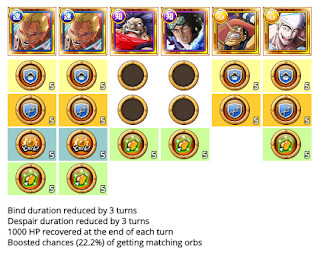 With these sockets you have covered 1000 autoheal each turn, 3 turns chain/despair resistance and even a nice slot of more orb luck you shouldn't understimate. You can also try it with the Merri ship, but you will lose a lot of HP. Good luck. According to socket preparation this should be the easiest if you can clear the raidbosses. If you want you can even put CDR or more lucky orbs in it. Or exchange Breed for Perona/ Alvida. Just do PERFECTS and win. 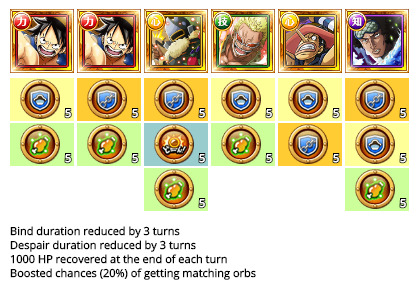 Other Legends currently lack the orb socket content. Or "Socket Tomes"